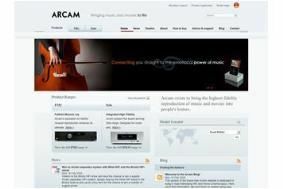 Arcam's website gets a makeover | What Hi-Fi? There's also detailed information on its entire product range, including discontinued models, plus a series of relevant technical articles. Other features include a postcode search function that allows you to find your nearest dealer, advice on how to choose partnering equipment for your system, and downloadable PDF manuals for every product in Arcam's range to help you set up your kit correctly. And if you really get stuck, you can post a blog so others can help you out. Regular users can also sign up for Arcam's newsletter and RSS feeds. Check out the News channel for industry and product updates, and you'll even find a link to our own Arcam blog and our Bristol Sound and Vision Show competition.